Awww, what's wrong? Are you crying? Don't cry, you're researching Halloween costumes. It's supposed to be fun. Oh, you've got some allergy problems? Are you allergic to ragweed? Maybe it's Krispy the cat, poor guy, he doesn't mean to have hair that's full of allergens. Well, either way, your nose is running hard! Well, maybe this is a good thing. Your nose could be the first facial feature that ever ran a marathon. Training your nose won't be easy. It's also going to be super gross. You'll have to forego taking any more allergy medication and just embrace your snotty lifestyle. Push your nose to its limits. Go ahead and pet the fluffy kitty. Use extra pepper on that soup. Hey, you could even stop and smell the roses. Let's be honest. You're probably not going to run a marathon anytime soon but your nose can do the running for you. It might be a little miserable but at least you're not the one running the laps. This costume is quite ridiculous, embracing the puniest side of life. 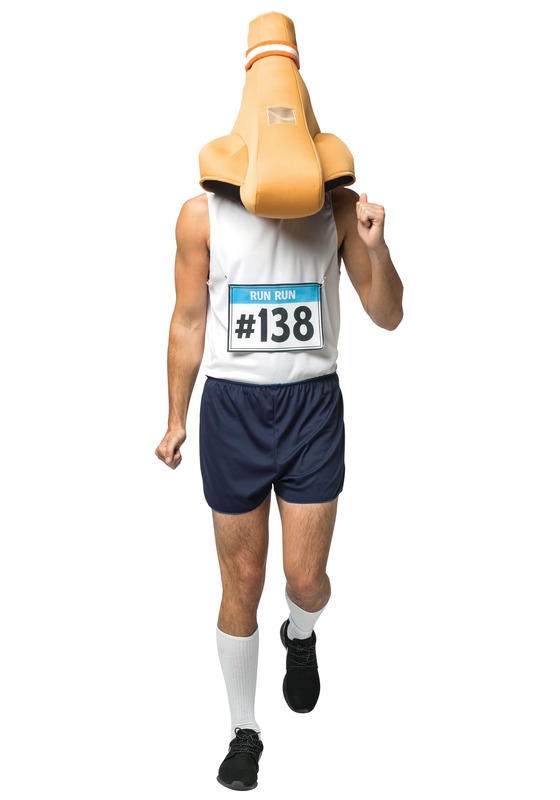 This costume includes a white tank top perfect for the big race. It also includes a pair of shorts, a race number, and the glorious nose headpiece. The headpiece is a lightweight foam and has an eyehole so you can kind of see where you're going. Pair this with a good pair of running shoes and you'll never know where you'll end up. Follow your nose, this is a gold medal costume!